Gas fireplace inserts provide convenience and consistency when it comes to indoor air quality. Add an insert to your existing fireplace to achieve a more efficient, cleaner burn. 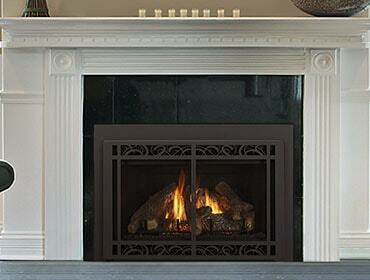 A quality Heatilator gas fireplace insert will dramatically change the efficiency of any fireplace. Instead of losing heat and energy from the draft of an open-masonry hearth, preserve heat energy and propel the warmth into the room with a gas insert. These inserts add value and warmth to any living space and are easily controlled by the flip of a switch. Say goodbye to draft, ash and smoke and say hello to an easy, enjoyable and relaxing fireside experience.